In order to exchange shipping data you will need to first prepare Magento to communicate with NRG Ship Connect. Enter in a Role Name - Think of this as a group or position name, not a username. NOTE: You will need the User Name and API Key to setup Magento in NRG Ship Connect. Now that you have finished preparing Magento, you need to setup NRG Ship Connect to finish the integration. Within NRG Ship Connect navigate to Preferences > Defaults > Automation and in the Import Options section select “Import Magento”. 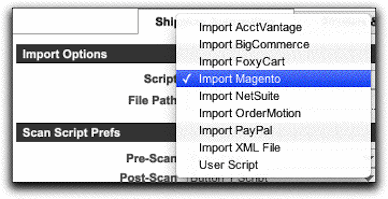 Once you select “Import Magento” from the Import Options menu, the Magento Integration Settings tab will appear. The information entered here allows NRG Ship Connect to connect with your Magento eCommerce system. Username - This was the Username you created during Step 3 of the Magento Setup. API Key - This is the same API Key you entered for the user in Step 3 of the Magento Setup. Order Statuses to Import - Type the Magento Statuses of the orders you would like to import into NRGship. If using multiple statuses, make sure to put a comma and space in between each status. Attribute Codes to Import - Type any Magento Attribute Code you would like to import into NRGship. 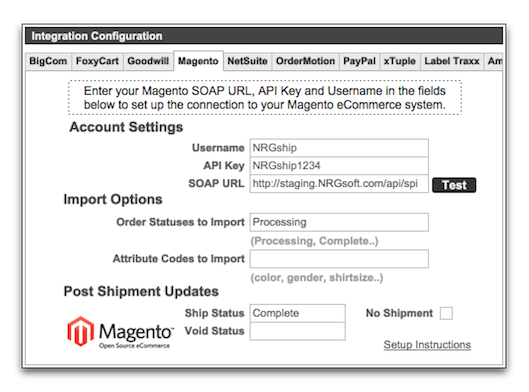 Ship Status - Type what status you would like the Magento Order to appear as upon successfully shipping the order in NRG. Void Status - Type what status you would like the Magento Order to appear as upon successfully voiding the order in NRG. NOTE: If you ship and void a Magento Order, then reship, you will have to manually update the shipment information in Magento. No Shipment - Checking this box will allow you to ship Magento Orders in NRG, but NRG will not create a shipment record within Magento. You will receive the message below once you have entered in all of the correct information and click on “Test”. Once you select Import Magento and you have entered in the valid Magento information, the Custom Buttons section will automatically populate. These settings can be found within NRG Ship Connect Preferences > Developer > Shipper Automation Tab in the Custom Buttons section. See the default settings listed below. Once NRG Ship Connect and Magento are setup, you can download all of your orders matching your selected order status by clicking on the "Get All" button. The orders will download and populate in the shipping list. You can also download orders one at a time by entering the order number into the box and pressing the "Get Order" button. After shipping, the tracking number will be updated in Magento and the status will be updated to Complete.